This is the true success story of Lemonlight Media, a video-marketing production company. It’s also the story of how to grow your business without losing control. In less than 20 month, Lemonlight Media grew from three people in a second bedroom, to 21 people in five major cities. We spoke to their CEO, Hope Horner, about growing pains and how to overcome them. Horner’s interview reveals how easy it is to lose control over your business as it’s growing. This is a very common pain for growing businesses. We’ve heard it many times before, from managers of hugely successful companies using our tool — monday.com — like AOL online, Discovery Channel, Uber, Wix, and Spot.im. The interview is followed by screenshots of exactly how Lemonlight Media uses monday.com to manage their video production activity. 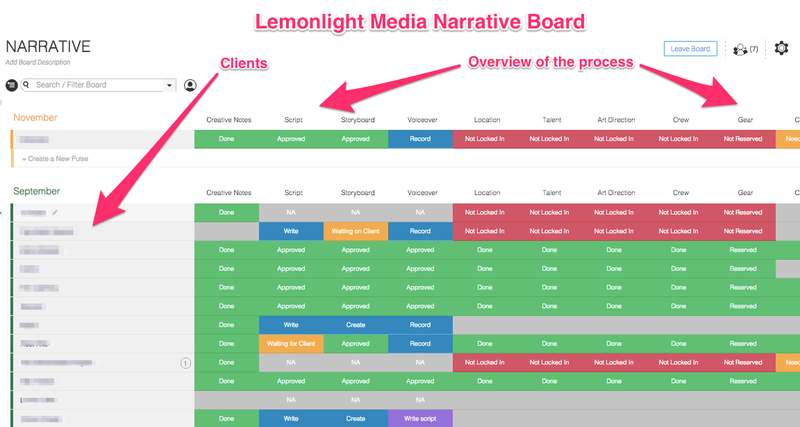 Q: What does Lemonlight Media do? A: We’re a video production and marketing company, specializing in hyper-local targeting. Our mission is to create high-quality affordable video content for everyone. Q: How did you start out? A: We founded the company in April 2014, in our co-founder’s spare bedroom. We bootstrapped the first year. We used the lean startup approach — we created a really simple website on Squarespace for $10, and started testing the market. We wanted to see if people were interested in videos for their business. When we saw it was successful, we invested more into our brand and continued to grow slowly. Q: And how big are you today? A: Today, we have 21 full time employees and offices in five major cities: Los Angeles, New York, Austin, Chicago and Washington D.C. We produce over 130 online commercials each month. Q: What was the business rationale behind your focus on online video marketing? A: Video content was becoming more and more popular. Three years ago, the average commercial cost $350,000, which was limiting the number of people who could create high-quality, visual content. At the same time, there was a rise in effectiveness of online commercials. 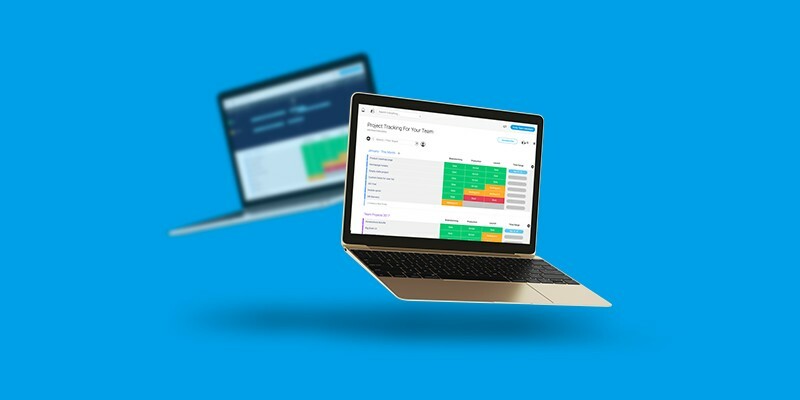 We saw an opportunity to make it affordable for SMBs. Q: How are you different from the competition? A: Most large production companies aren’t targeting SMBs. So our biggest competitors are the independent videographers around the country. Some of them do offer some of the services we do, at a pretty comparable rate. The biggest advantage we offer is consistency. We have a full time team, that’s dedicated to delivering you a beautiful commercial within four weeks. Also, we have a satisfaction guaranteed policy. A video isn’t deemed complete unless the client loves it. Q: Do you measure results? A: Definitely, we measure everything. Some clients are looking for a direct response campaign — where they actually drive customers in the door. Others are looking for a brand awareness campaign. Either way, we capture all of their data for them: How many people watched part of their commercial, how many people watched the commercial, how many people clicked for more information. We also capture data on the most engaged demographic and geographic elements. We constantly A/B test the videos and add layers of creativity to create engagement right there and then. On average, our click-through-rate is ten times the industry average. Q: SMBs owners have so much on their plate. How do you capture their attention? A: It’s not easy, for sure. We take a proactive approach to make sure that they’re comfortable. On average, 70% of our sales happen in person. We have teams all over the country, and they go and meet with interested clients. Once we meet them, it’s about the work — showing them examples of our work and explaining how easy we make it for them. Q: What’s the one core thing you do that helps your customers grow? A: We give them a very easy and effective way to advertise digitally. Q: Do you have growth goals to yourself? A: Of course! We want to be in all the major and secondary markets by the second quarter of next year. We also have a plan to grow our Partner team starting in January, where we work with marketing agencies around the country to help them offer video solutions to their clients. Q: Could you share three tips for SMBs wanting to reach the local market? 1) Do your research. Find out what’s going to convert the best. You’ll find over and over again that it’s video. Right now in 2015 and probably in 2016, it converts better than any other online medium. 2) Measure results. You need to be prepared to invest a little money if you want to advertise online. So make sure you’re measuring your results so you can determine if the ROI makes sense for your business. 3) Stay on top of trends. The market is changing constantly. Keep up. Read blogs or industry publications and stay in the loop about how to create fun and creative marketing campaigns. Q: Bottom line — how much does a video cost? A: Our price range is between $300 and $5000. An engaging 30-second commercial costs $1000. Q: What is the number one pain monday.com solved for your business? A: At any given point, we have roughly 300 clients running through various parts of their production or distribution cycle. Prior to monday.com, I had zero insight where our customers were in their life cycle without digging through emails or other software programs. monday.com gave me a simple way to see exactly where each customer was in their life cycle at any given point. Q: What was “before monday.com”? A: [Laughs] Microsoft excel + basecamp + memory + whiteboard. We had a very similar [to monday.com] Excel sheet that we shared on Google Drive, so when I saw the product, it was a no brainer. It was amazing. The UI itself is very clean and very easy to use. I like the ability of customizing each Board based on each department’s needs — our Post Production Board is different from our Pre Production Board. Q: Would you say monday.com contributes to the growth of Lemonlight Media? A: Definitely. monday.com has shortened the life cycle for our clients. Before monday.com, if we had an unresponsive client, it took us about a month to realize it and reach back out. With monday.com, we instantly see what we need from each client and we’re able to remain very proactive. Today, quite literally, everyone gets in in the morning, and they look at the monday.com Board to see the top priorities. A doctor manage his surgery information with monday.com! "The biggest benefit I get from monday.com is organization and communication in real-time." Learn how their huge operation stays running smoothly.